" Giraffes are superbly adapted to exploit a food source that is out of reach for other hooved animals. They feed almost entirely on leaves of acacia, mimosa, and wild apricot trees. The 18-inch tongue is wrapped around a branch and as the head is pulled away, leaves are stripped off. To reach the ground a giraffe must spread its forelegs widely and well to the front or bend at the knees. They are vulnerable to lion predation when lying down, ground feeding or drinking. Giraffes usually sleep standing up but do lie down occasionally. 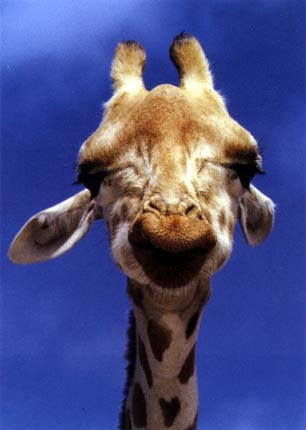 Extreme height provides giraffes with an excellent range of vision. Females may be 14-15 feet tall and males 15-17 feet. Giraffes range in weight from 1210-3960 pounds. They have excellent vision, hearing and sense of smell. The long neck contains seven vertebrae (the same number as most mammals, including humans). There is a series of valves that regulates blood flow to the head. The color pattern varies among the five subspecies, but is essentially dark reddish to chestnut brown blotches of various shapes and sizes on a buff ground color. The underparts are light and unspotted. At first glance, giraffes seem ungainly. They are actually not only graceful, but fast and may gallop at 35 mph. Their more characteristic gait is the pace, where both legs on one side move simultaneously as they majestically roam the dry savannahs and open woodlands. To defend themselves, they kick with their forefeet and may use the head to give blows. Rival males fight by swinging their necks and striking with their heads from the side. Giraffes are usually seen alone or in small, loosely organized groups of 2-10. Females with young will sometimes aggregate and one to two adults may remain with all of the calves while the rest go off to feed. Calves are born after a fifteen month gestation period. The number of young is usually one, but some twins do occur. A calf is six feet tall at birth and is able to stand after about twenty minutes. Females attain full size by the age of five, and males by the age of seven. Giraffes have horns unlike any other mammal. They are present at birth as cartilaginous knobs which rapidly ossify. They grow slowly throughout life and are covered with skin and hair. Hair may become worn away from the apex of the horn." Recent research (2007) suggests there are, not one, but six giraffe species.